Images of the upcoming Hyundai Venue subcompact SUV have been leaked online. While the SUV is set to be unveiled in India on April 17, the same day the new Hyundai Venue will also be showcased at the New York International Auto Show 2019. 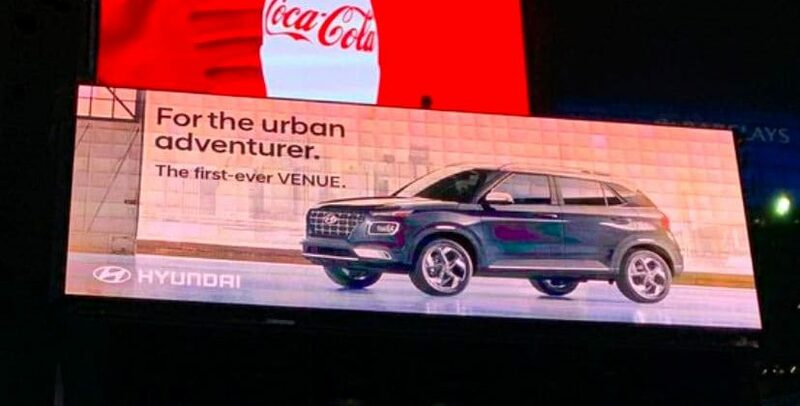 Now, ahead of its official debut, images of the new Hyundai Venue have been featured on one of the Times Square billboards in New York City, giving us a very first look at the upcoming SUV. As for the market launch, the new Hyundai Venue is slated to go on sale in India on May 21, 2019. 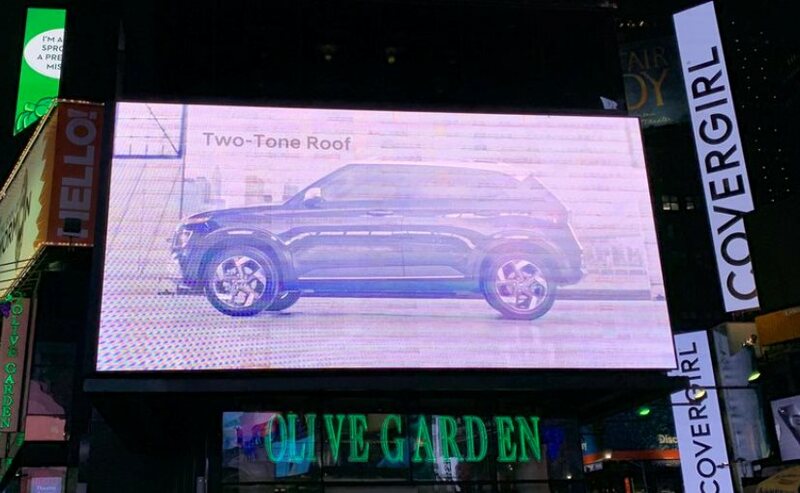 The Hyundai Venue featured at Times Square is a dual tone model which appears to be in a shade of blue with a white roof. Based on a bunch of recently released spy photos, we already have a decent idea as to what the exterior of the SUV will look like. Up front, the SUV gets Hyundai’s new signature cascading grille in chequered pattern with chrome highlights. Furthermore, like the Kona and new Santa Fe, the Venue too features dual lamp setup with the LED daytime running lamps positioned above flanking the bonnet line, and the main projector headlights positioned below with chrome surrounds. The two-tone pattern is carried over onto the ORVMs as well, while the blacked-out pillars help create the floating roof illusion. As seen on most SUV, the Venue too comes with black claddings along the wheel arches and side skirts, along with a set of sporty-looking dual tone diamond cut alloy wheels. We do not get to see the rear section of the SUV in these latest images, however for that, and also the cabin images, we will have to wait for the official debut. 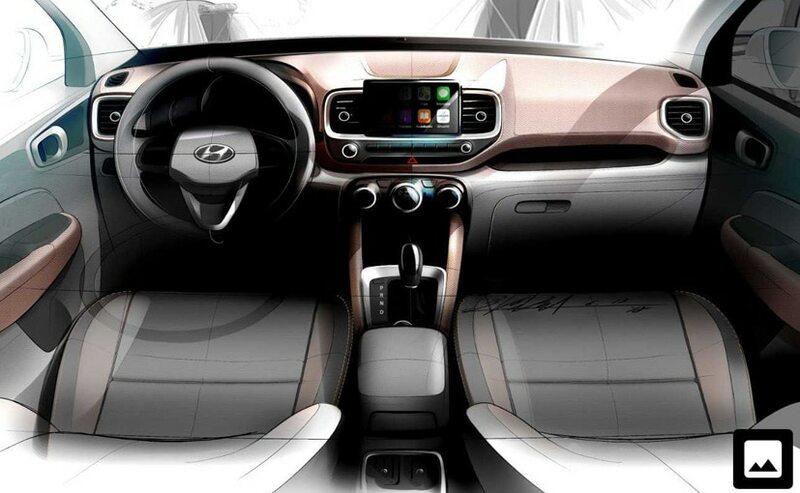 Having said that, based on the recently released interior sketch, the new Hyundai Venue will be offered with a dual-tone dashboard with a large 8-inch touchscreen infotainment display with Android Auto and Apple CarPlay, along with an automatic transmission. The Hyundai Venue will also get the Blue Link connectivity system featuring 10 India-only features with a total of 33 connectivity features including geo-fencing, speed alerts, SOS, panic notifications, destination sharing, and road-side assistance and so on. Under the hood, the Hyundai Venue will come with a 1.0-litre T-GDi Turbo petrol engine along with the 1.4-litre turbo diesel. The engines will come mated to a 6-speed manual and a 6-speed torque converter automatic transmission, while there will also be the 7-speed dual-clutch automatic available as an option.